Best Google Play Store Alternatives | Best Apple App Store Alternatives: Is your mood spoiled because you cannot download best apps from official app stores for free? Well, this is happening with every smartphone user these days. But don’t be worried now because we have brought to you the best app stores for Android and best app stores for iOS. People want to try out paid stuff but companies demand huge money to pay just for using that app. And if the user didn’t like the app then he/she will lose their money on that app. Because we at RapidTricks always think about our audience perspective and this is why today we are going to cover all Android and iOS users in this post and resolve their issue for downloading paid stuff. I know it is annoying to pay for every single app when you have already paid for an expensive iOS device. We know that the developers are working hard to build those apps for iOS and Android users. But everyone can’t afford them to purchase and they have no way except downloading the cracked versions of those apps to fulfill their needs. So that is why we are going to talk about the best app stores for Android and best app stores for iOS. You can download any of the app stores on your Android or iOS device whichever you like the most. So let’s get started and learn what you can use instead of Official apps stores to download your desired apps for free. 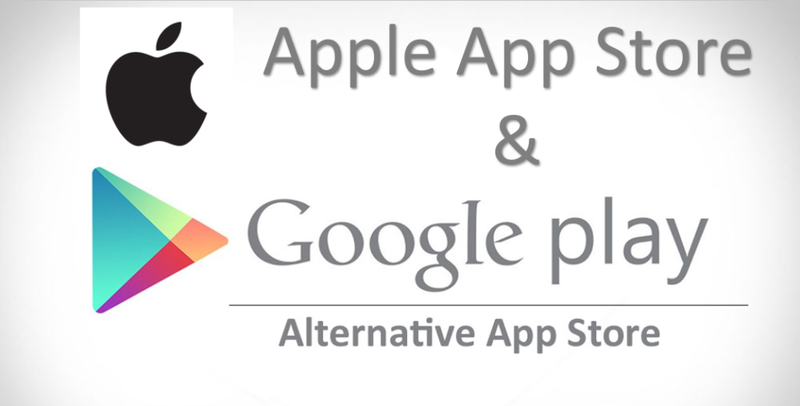 You will check Best Alternatives of Google Play Store & Best Alternatives of Apple App Store. And we can bet you will fall in love with all alternatives because the entire app store we are going to cover will offer a user to download and install paid apps and games for FREE of cost and no hidden charges are there. YES, you heard it right and you can download all the paid stuff that is listed in the paid category of official stores. So isn’t it the best choice to download from? You need to read this entire post very carefully and download your favorite app store after checking this post. All app stores we are going to share are mix and some works on both platforms and some only works for iOS devices. So let’s check out the list of free app stores for Android and best apple app store alternatives. ACMarket APK is the best choice while searching for the perfect alternative to Google Play Store because it gives you the ultimate freedom to download paid apps, games, themes, launchers, trendy icon packs and much more for FREE. Unfortunately, the ACMarket app store is not available for iOS devices, but we are waiting for its release for iOS devices and we hope it will be available to download for iOS users soon. If you are an Android user then go ahead and download the ACMarket App store on your Android device. It is the second most demanding app store in the world in top alternatives of Google Play Store & iTunes category. You must check this app store for downloading paid stuff for free and never pay for paid apps. miOS Haimawan app store is a Chinese app store that is filled with unlimited popular apps and games that are in the paid category on official stores and a user can download miOS Haimawan app store for FREE and download all apps and games for FREE. FlekStore is an iOS app store so by using this you can save your lots of bucks that you spent on Apple App Store that can run on iPhone, iPad & iPad Mini. It is one of the best apple app store alternatives. If you want to replace Google Play Store as your official app store to download apps and games then you need to check out AppVn APK because you can have tons of best options to download from AppVn which you can’t find on Play Store. Try appvn apk now on your android phone. I hope You will surely love this post on “Best Alternatives of Google Play Store & Apple App Store” now you have plenty of platforms to download paid apps for free. If you like this article then support us by sharing this post with others on social media and let others know about the cool stuff we share here.